Sir Richard Branson, the world famous British business magnate, founder of Virgin airlines and other businesses in the Virgin group, was recently in Lithuania. The primary reason for his visit was to be the Keynote Speaker at ā€�Forum Oneā€¯, the biggest leadership forum in Eastern Europe, which took place in Kaunas June 1-2, 2013. While in Lithuania he was awarded an Honorary Doctorate by Kaunas University of Technology on June 2. 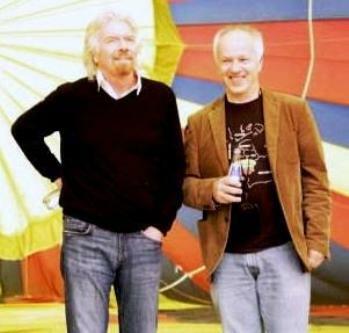 He also took time to meet with Lithuanians and was excited to be able to take a balloon trip above Kaunas and surrounds. He described Lithuania as a wonderful country full of interesting, friendly people. He said that in Lithuania ā€¯there are lots of well-educated young people and I met many young entrepreneurs who are setting up forward-thinking international companies focusing upon everything from aircraft maintenance to the internetā€¯. Friendship with Lithuanian business leader Dr. Vladas LaÅ�as was instrumental in getting Sir Richard to Lithuania (on this website News Archive/ Lithuanians in the News/ 13th May 2012).